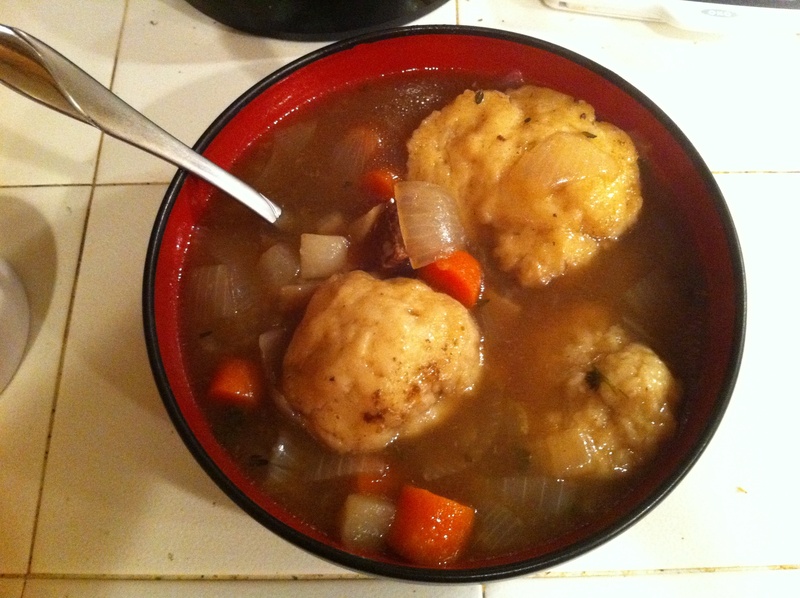 Still being in my soup mood, I thought it would be nice to try Gravy Soup, which was posted a few recipes back. Considering the name, I thought this would be a thicker, gravy or stew like soup. With this in mind, I set out my ingredients. I hope you will forgive the image quality here, but I was using my iPhone instead of my regular camera because the battery was not charged. After all this chopping I also cut the meat into bite sized pieces, and then put it into the stew pot once the butter was melted. 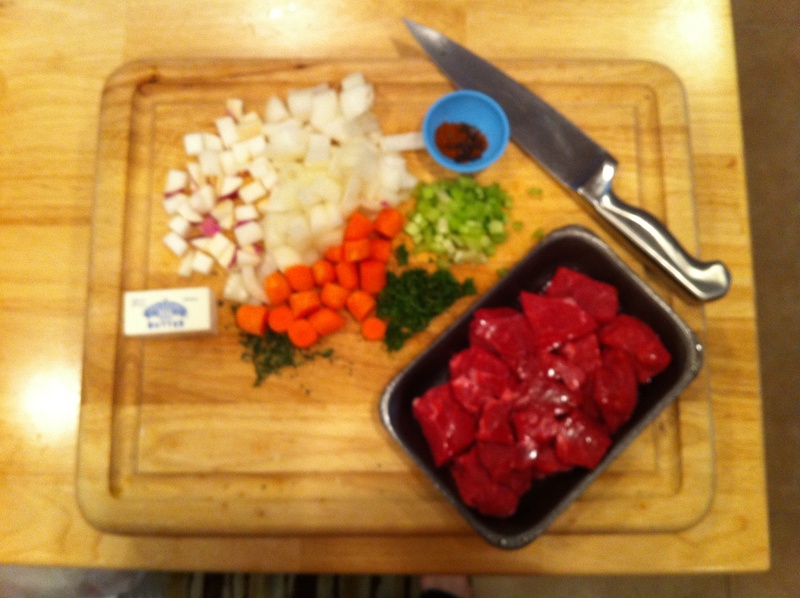 Following the instructions, I let the meat brown for about 5 minutes, then added the vegetables and herbs & spices. This really was starting to smell good at this point. The mace is an interesting smelling spice. It is the outer husk of the nutmeg and the individual pieces are called blades once dried. I imagine that Maggie Ritchie actually would have ground it fresh, which is time consuming since it is somewhat of a woody type of item apparently. It has a bit of a nutmeg odor with a savory touch. Having never cooked with nutmeg outside a baking project, mace in with the other ingredients was an unusual combination to my nose. However, I figured I’d give it a shot. 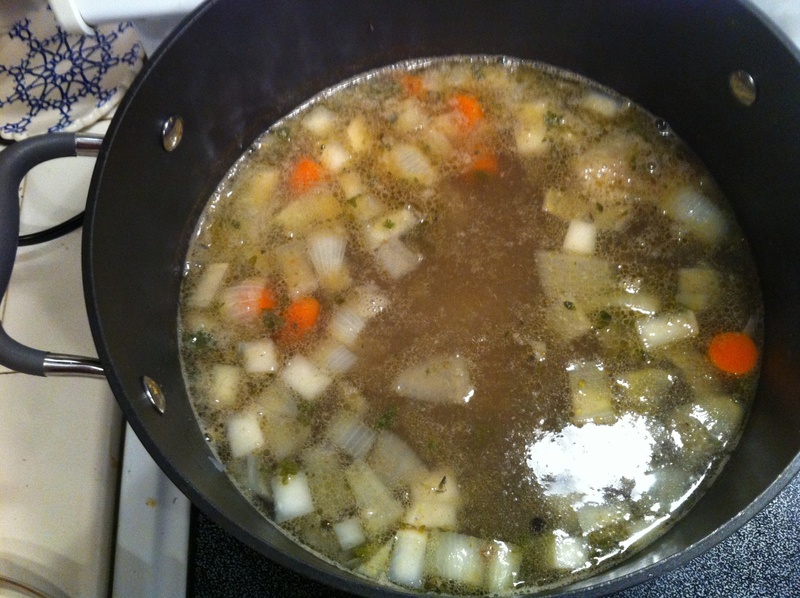 Once I added the 8 pints of water (16 cups) I knew this was not going to be a stew like dish. Again, going with it, I left the lid off, brought it up to a boil then took it down to a simmer and let it go for 1 1/2 hours. Finally it was time for dinner and I knew this was going to be a “now or never” moment. I tried the soup. It was very bland. It smelled nice, but upon tasting the broth was thin and rather tasteless. I think if I were to make this again I’d cut the water in half, at a minimum. It seems like just too much water for so small a volume of flavorful ingredients. 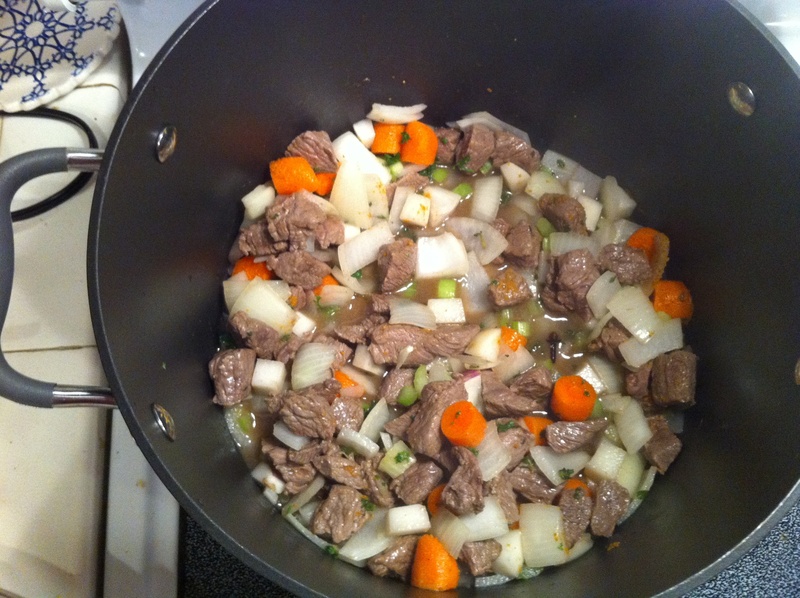 Being as I could not leave well enough alone, I added some beef bouillon, garlic powder, salt & pepper. And dumplings. With the dumplings the broth thickened a little bit but it was still quite like a broth soup rather than a stew. I would have much preferred stew and so perhaps in future I will make this general idea of the soup beginning, then diverge at the quantity of broth. Should you like to try this dish, I suggest cooking to your taste as you go along.